Have you ever wanted to do a straight set of 100 push-ups? Neither did I until a few of my friends got together and decided to give it a go. On top of my regular strength training (11 weeks left of Maximum Strength) for the next six weeks or so I plan on attempting to do a straight set of 100. I'm following the program laid out on OneHundredPushups along with my buddies. It's 3 days a week and takes less than 10 minutes so the additional volume isn't really that concerning. We're tracking our progress on a google spreadsheet. 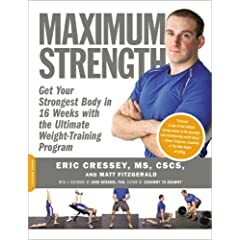 With nine people who have taken the initial test it will be interesting to see how many people actually make it through the program, and how many actually succeed in doing a straight set of 100. I'm not sure that six weeks is all it will take, but I'm going to give each workout a shot and see how many I can do. I've already completed the first 2 sessions for week 1. I plan on making a video of the 100 push up attempt so you can look forward to that. Are you up to the challenge?